There are many different solar water heating systems possible, many of which are described in the REUK.co.uk website (links to related articles are provided throughout this article). Almost all new homes and many older homes now do not have a hot water cylinder, and so short of installing one, there is almost no way to set up an economical direct solar hot water system. Here we will present a very simple method to preheat water before it reaches a tankless boiler. A combi or condensing boiler is fed directly with water from the mains, arriving typically at a temperature of below 10 degrees Celcius. Every degree we can preheat the water before it enters the boiler saves the gas or electricity required to raise its temperature by that degree. In order to make a solar water preheater all that is required is a watertight tank or container, and a simple solar collector – for examples see these articles: DIY Solar Water Heating Prototype, Simple Solar Water Heating, Build a Concentrated Solar Water Heater, Evacuated Tube Solar Water Heating, and DIY Solar Water Heating. Pictured above is a schematic for the simple solar water preheating system. (Note that the solar collected must be lower than the storage tank for this system to work.) 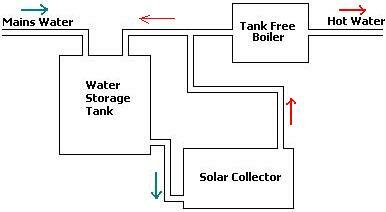 When the hot tap is turned off, water circulates from the water storage tank around the solar collector and back into the water storage tank thanks to the Thermosyphon effect. No circulation pump is required as hot water rises (or to be more accurate: cold water sinks). The colder water in the storage tank drops down to enter the base of the solar collector and is heated by the sun. As the heavier colder water in the storage tank continues to try to get to the lowest point of the system, the lighter hotter water is pushed up out of the solar collector and back into the top of the water storage tank replacing exactly the water leaving the bottom. 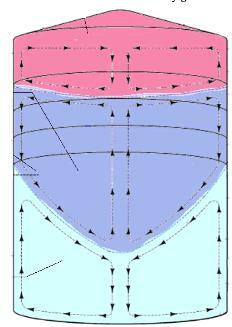 This circulation of water results in stratification of the water in the storage tank which means to say that there is a layer of hot water sitting on top of a layer of colder water – see the image above for typical convection currents in water in an insulated hot water cylinder. When the hot tap is turned on, preheated water from the top of the storage tank feeds through the boiler (where it is further heated or mixed with cold water if necessary) and comes out of the hot water tap. At the same time cold mains water enters the top of the water storage tank sinking quickly to the bottom and completing the cycle. On a cold day and cloudy day – i.e. colder than the arriving mains water – the cold water in the tank and collector will just sit there not circulating, and so mains water will effectively be fed directly into the boiler. All connecting pipes and the storage tank must be well insulated as must the solar collector to ensure that nothing freezes up. See also our article on the Solar Bread Box Batch Heater.